Moving is one of the most stressful events of a person’s life. Now, imagine that you’re nearly half your size, on four legs, and can’t understand your loving owners? Now that’s stressful. Metcalf Movers are here to help you make moving with pets as seamless as possible with these three tips! Whether you’re doing it yourself or have hired professionals, moving with pets is “ruff” for anyone. However, a methodical plan and careful preparation can ease the process. Break out those pens and let’s make a checklist! A comprehensive plan will make the big day go smoothly for you and your pet. Whether you’re traveling by car or plane, every mode of transportation comes with its own set of preparation and challenges. Traveling by car? Take stock of how your pet currently acts in a vehicle. If they’re not used to being in the car, take them on a few rides before the move to get them acclimated to your car. Have a secure method of transport, like a dog-friendly crate or carrier. Sounds obvious, right? Well, only 16 percent of dog owners have driven with any form of pet restraint while driving. You and your pet’s safety should be your #1 priority. Many dogs and cats may also experience nausea when traveling long distances. Pack a pet-friendly bag with food, water, toys, and any pet medication. Traveling long distances? Secure pet accommodations prior to travel. If your travel time is extensive, ensure all reservations are pet-friendly, pack an overnight bag, and don’t forget the crate! If you’re flying, ensure that your crate adheres to the regulations and standards set by the International Air Transport Association. Be aware of the time of year, as well. Many airlines will not fly with pets in cargo if temperatures are freezing or extremely warm. Once you’ve unpacked and settled, it may feel like the hard part’s over, but for your pet, it’s just beginning. New smells and a new environment will be confusing to your pet and you may see a temporary new, stressful side to your furry friend. Unpack their bed, toys, and other familiar items first to establish a sense of familiarity. Within the next few days in your new home, update your pets information, tags or microchips, with the new address and phone number. Finally, remember to be patient. This is as new of an experience to your pets as it is for your family. Need a Hand Moving with Pets? 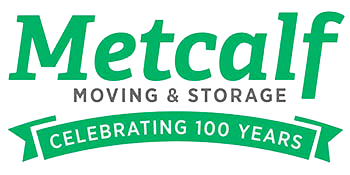 Metcalf Moving & Storage is the customer choice for reliable, professional movers. Check out our latest moving tips and receive a free quote.